Sooooooooooo……its has been awhile. I have probably 4 or 5 sessions to blog, and the great screen has flashed upon my WordPress admin screen….”You are out of Space”. It is a struggle as a photographer of always running out of space. Space on your hard drive, on you computer, on your camera, on your website….and now on my blog. Yes, I can buy more room, but why do I want to do that? Spend more money. 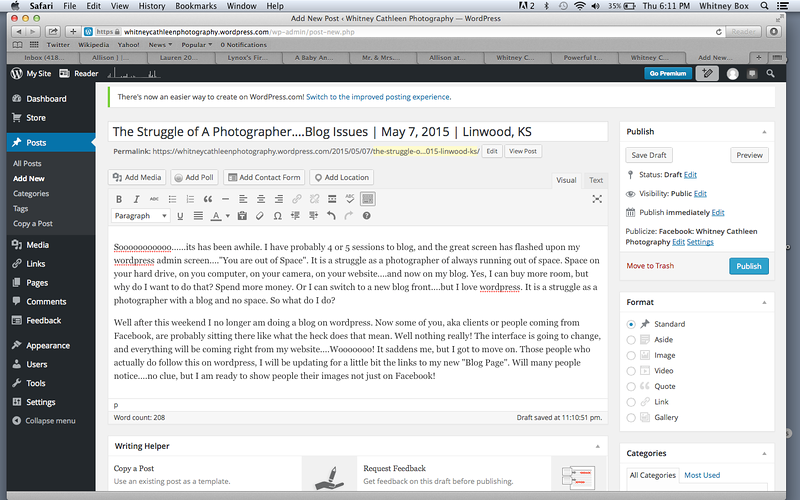 Or I can switch to a new blog front….but I love WordPress. It is a struggle as a photographer with a blog and no space. So what do I do? Well after this weekend I no longer am doing a blog on wordpress. Now some of you, aka clients or people coming from Facebook, are probably sitting there like what the heck does that mean. Well nothing really! The interface is going to change, and everything will be coming right from my website….Wooooooo!It saddens me, but I got to move on. Those people who actually do follow this on wordpress, I will be updating for a little bit the links to my new “Blog Page”. Will many people notice….no clue, but I am ready to show people their images not just on Facebook!